It can be difficult to tell when snakes are asleep or awake. That’s because snakes sleep with their eyelids open. This begs the question, how long do snakes sleep? Do they sleep every night in their hide, or take naps throughout the day? Snakes are one of only a few animals that don’t sleep in a way that we understand. Scientists aren’t sure how long snakes sleep, because they are often lying still and doing nothing while they’re clearly awake, and hunting. The only definitive way to tell if a snake is asleep is by moving near them and disturbing them, waking them up. 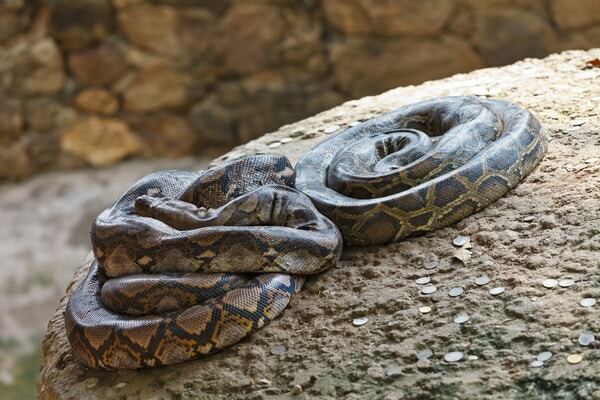 Snakes sleeping habits are still puzzling scientists today. So if you have a snake and you’d like to find out more, then you might have to do the research yourself. 2 Why is My Snake Always Sleeping? 2.4 Do Snakes Sit Still When They Hunt? 2.5 Do Snakes Sleep More After They Eat? 2.6 Are Snakes Less Active in Winter? 2.7 Do Snakes Sleep More When They’re Ill? 2.8 Can Snakes Get Bored? 3 Where do Snakes Sleep at Night? 4 Where do Snakes Sleep in Winter? 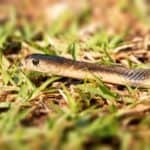 4.1 How do Snakes Sleep Without Eyelids? 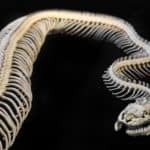 Snakes don’t have tiny beds to sleep in, and they don’t curl up and start snoring, so how can we tell whether they sleep? Well, it’s impossible for them not to. Every animal in the animal kingdom has to sleep, one way or another—that includes fish, sharks, birds, mammals and us. So, scientific evidence does point to the fact that they sleep. One of the best ways to tell whether an animal is awake or asleep is to use an EEG monitor. This is an ‘electroencephalogram,’ which is a scientific way of saying ‘brain wave monitor.’ No EEG experiments have been done on snakes, however, simply because no scientist has been interested enough to study the topic so far. As a snake owner, you know that your snake sleeps. You can tell because they’ll sit still for hours on end, not moving or reacting to any stimulus. And when they wake up, they seem a little surprised, just like we are when we wake up from a long night’s sleep. Why is My Snake Always Sleeping? If you’re used to the usual pets, no doubt your favorite time spent with them is playing with them or taking them for a walk. But snakes are completely different. Snakes don’t need to go for walks, and they don’t play in the same way that other pets do. They seem to spend much of their time asleep. But why do snakes move so little? The most important reason why snakes are inactive is that they’re cold-blooded. Being cold-blooded means that they don’t generate their own body heat, a trait they share with all other reptiles and insects, too. Instead, they rely on external sources of heat like the sun, or rocks that have been warmed in the sun. So, what does this have to do with snakes sleeping all the time? Well, snakes spend lots of their time regulating their temperature. Every day, they have to sun themselves in a basking spot, where they’ll warm up. During this time they’ll generally be quite still, unless something comes along to disturb them. Then, when they need to cool down, the same applies. However, this doesn’t just take a few seconds. For us, a few minutes in the sun can be enough to warm our skin to the point where we want to find some shade. But that’s because we generate heat internally, so we warm up much quicker. Snakes have to warm their entire bodies just from a light bulb above them, or a heat mat below them. That can take a surprisingly long time. The fact that snakes are cold-blooded also relates to how they use energy. Mammals like humans use up to 70% of our energy intake to keep our bodies warm. Our organs need to be at a certain temperature to work properly, so we ‘spend’ most of our energy just on keeping ourselves warm. To maintain this high energy level, we need to eat regularly. Snakes don’t need to maintain these high levels of energy. So you might expect them to be more active than humans. But snakes only eat very infrequently, so they still need to conserve their energy. They do so by being inactive for most of the day, either sleeping or sitting still. The period before a snake sheds, or the ‘blue phase’ as it’s known, is a time of several different changes. Your snake’s behavior, for example, becomes quite different. They’re grumpier and less comfortable with being handled. But aside from that, the snake will also spend more of their time inactive than they otherwise would. Why are snakes less active when shedding? Because they’re more vulnerable than usual. Their blue eyes are a result of an extra eye cap forming under their old one, before the old one has had a chance to drop off. This means that they can’t see as well as normal. So, before their old eye cap comes off, they have to hide to avoid predators and threats that they might not be able to see. Whether the snake is sleeping or not isn’t necessarily clear. But it’s best to leave them, either to sleep or to be inactive. If you were to try and handle them, they would see you as a threat (because they can’t see you at all). Leave them alone until they start shedding, then help them if necessary. Do Snakes Sit Still When They Hunt? Many snakes actively hunt, meaning that they seek out prey that they can smell. They’ll make their way into a mammal’s underground burrow, for example, or climb through tree branches to find small birds to eat. Other snakes take a different approach. Some snakes are termed ‘ambush hunters.’ This means that they actually sit as still as can be, and wait for prey to come to them. According to Zoology, this approach is usually used in habitats where there’s plenty of food. 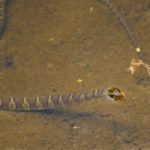 But the point is that even the most experienced herpetologists can’t tell the difference between one of these snakes hunting, and one of these snakes sleeping! It’s even thought that snakes might be able to sleep and hunt at the same time. This is achieved in many species by virtue of turning off one half of the brain at a time. Essentially, the left half of the brain might be dreaming, but the right half is awake and alert. This would allow them to rest and wait for food at the same time. You can see this frequently in birds. If you ever spot a bird that has one eye closed and one eye open. They won’t be hunting, they’ll be looking out for predators, but the mechanism by which they do so is the same. To be clear, it hasn’t been proven that snakes can do this. But it is a possibility. Do Snakes Sleep More After They Eat? Snakes also sleep more after they’ve just eaten. The fact that they’re cold-blooded means that they have to warm their belly to digest. So, they’ll go somewhere that they can bask, and sit there for as long as possible. Keeping their belly warm helps foster gut bacteria, and hastens the breakdown of the food, first in their stomach, and then in their gut. Not only that, but snakes are inactive after they eat because they’re particularly sensitive to threats. If a predator were to come along immediately after they eat, they wouldn’t be able to get away quickly with such a big bulge in their neck or belly. So, they would have to regurgitate their food. To avoid that, they’ll try and find a warm spot where there’s little chance of being disturbed. While it’s unlikely that they’ll sleep right there in the basking spot, they will be inactive for an extended period of time. They may also go to their hide when they don’t need to warm up anymore, and be inactive there instead. You don’t have to do anything to help them. All you should do is wait until they’ve finished digesting and gone to the toilet. Then, they’ll be right back to normal. 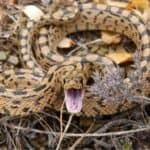 Are Snakes Less Active in Winter? Mate until the springtime, because if they mated in the winter, their eggs would be laid when it’s too cold. Eat regularly until the springtime, because they need their bellies to be warm to digest. Spend a lot of time above ground until the springtime, because spending too much time in frost can kill them. These behaviors are carried over to when the snake is in captivity, if you allow the temperature to drop slightly. Your snake will spend most of their time in their hide, not coming out either to explore or to eat. However, even if you maintain the temperature at the same level, there’s a chance that they will be less active anyway. That’s because another cue to tell them that it’s winter is for there to be lower levels of sunlight. So if they can see through a window that it’s getting dark early, this can cause the effects above, at least to an extent. Do Snakes Sleep More When They’re Ill? It is possible that your snake is ill if they’re sleeping more than they usually do. Lethargy is the medical term used for not having the energy to move around and do anything, and goes hand in hand with being weaker than usual, too. So, for example, your snake might be lying still as if asleep. When you go to pick them up, they’re too weak to coil around your hand tightly. Lethargy is a common symptom for many conditions that your snake might be experiencing. However, you’ll only see it in conjunction with other symptoms. If you see lethargy paired with mucus running from their nose, and with open-mouth breathing, they likely have a respiratory infection. If you see lethargy paired with a bright red underbelly, or with mouth rot, then your snake is likely to have sepsis. 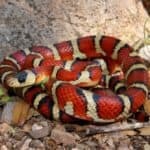 If you see lethargy paired with tiny dots on your snake’s back, or tiny insects hiding under your snake’s scales, then your snake has parasites. As you can see, lethargy is a general symptom. So if your snake is sleeping even more than usual, it might be worth checking whether there’s something else that’s wrong with them too. Your snake might have nothing to do. Whether they live in a cage or the wild, snakes aren’t highly active creatures. They aren’t social like many other animals. And they don’t play, not like other kinds of pet can. All of this adds up to mean that snakes don’t have much to do. As such, they’re going to spend a lot of their time doing nothing, either sleeping or lying still. Even so, it’s important to stress that snakes don’t get bored. They don’t have much to do. As a snake owner, it’s important not to anthropomorphize your pet because snakes don’t experience emotions like humans. To do so would mean that you don’t truly understand them. Using more than one kind of substrate, e.g., one they can burrow in and one that they can’t, which provides a different texture. Cheap piping, even toilet roll or kitchen roll tubes, that they can crawl through. Your snake’s enclosure should have at two hides. Dried leaves or soil to act like undergrowth. Fake plants which can hang from the ceiling, the walls, or be ‘planted’ in the substrate. Where do Snakes Sleep at Night? For starters, snakes don’t always sleep at night. Do snakes sleep during the day? Well, some do. Corn snakes are nocturnal, meaning that they’re active during dusk and night time. Garter snakes and ribbon snakes are ‘diurnal,’ which means that they’re active during the day. Snakes will try and find somewhere safe and secure to sleep during the night. They’ll find some basic shelter, either underground or on the ground. In a burrow that they made for themselves like the western hognose snake. Inside a bush or some undergrowth, where they’re unlikely to be disturbed. In and around tree roots, where predators won’t think to look. In the case of tropical and forest species, in the tree itself, curled up on one of the branches where nothing can reach them. The key is to find somewhere that nothing can get them. It’s like why we live in houses with locks so that nothing dangerous can get in. The more easily a snake is disturbed, the less they’ll be able to sleep, and the more difficult they would find it to do even basic things. Where do Snakes Sleep in Winter? Throughout winter, snakes go through a process called brumation. This is similar to hibernation, where the snake enters a period of low activity over the colder winter months. This is because they would be unable to digest food. Why? Because it’s so cold, and since snakes can’t produce heat, they need the warmth of the sun to help them digest (warmth makes digestion happen faster). Garter snakes sleep in big communal dens, with dozens or even hundreds of other snakes. Indian pythons brumate in large hollow trees or under rocks. They need to find somewhere big because the Indian python can grow to 21 feet long. Since western hognoses love to burrow, they’ll brumate underground. They might make a burrow, or find an old abandoned mammal burrow to save themselves some effort. So, it depends on the species! But even once they’ve found somewhere nice to sleep, how do snakes drift off? After all, according to BMC Veterinary Research, they don’t have eyelids that they can shut—just clear coverings called spectacles. So, how do they do it? How do Snakes Sleep Without Eyelids? It’s not precisely clear how snakes sleep without eyelids, although they do. They may sleep unihemispherically, which is a special way that some animals sleep. This is where half of the brain sleeps while the other half stays awake. Birds, for example, sleep unihemispherically. Why do they do it? Because while half the brain is asleep, the other half is still working hard. The bird keeps one eye open, looking around, and staying aware of its surroundings. This is very important in a species that has to escape from a predator at a moment’s notice. Snakes have to be alert for predators, because they’re not particularly fast, so they find it difficult to get away from one. 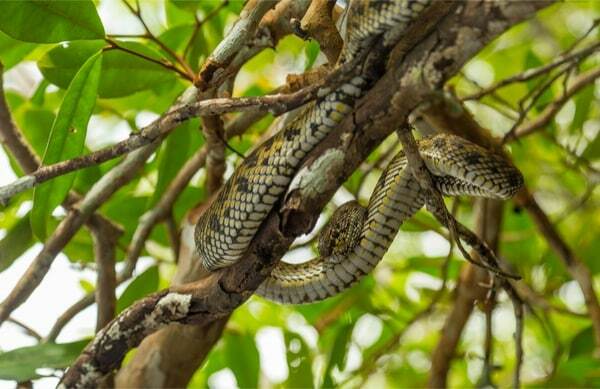 Ambush predator snakes spend most of the day waiting for prey. If half of their brain could sleep while they were ‘hunting,’ it would be a big advantage for them. They would effectively be resting and hunting at the same time, which no other animal can do. Regarding how they manage to sleep despite keeping their eyes open, that’s not so difficult. The reason we close our eyes while we’re trying to get to sleep is that the light stimulates our senses, which is the opposite of letting your brain sleep. There seems to be an urban myth that snakes can close their retinas while they sleep, but there’s no scientific evidence of this. For starters, it’s pretty much impossible to tell just from looking at a snake whether it’s asleep or not. Snakes don’t have eyelids in the traditional sense, so you won’t see them nodding off. Their eyes don’t gradually close like when we’re trying desperately to stay awake. And they’re typically quite still anyway, so sleeping doesn’t make a difference there. The only way you can tell if a snake is sleeping is by disturbing them. If they’re asleep and you move closer to them, for example, their reaction will be different than when they’re awake. A sleeping snake won’t move to come to see you or move away from you. It’ll just stay still. Waking snakes almost always react to you coming closer, whether that’s to move towards you (if they recognize you as a non-threat) or start getting defensive. A sleeping snake won’t flick their tongue. Waking snakes flick their tongue every once in a while, even if they’re sat still doing nothing. This helps them sniff the air around them, and sense if anything is going on. 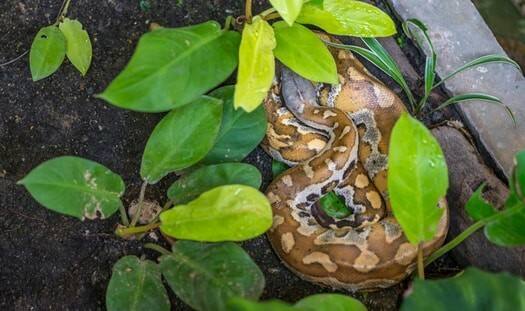 A snake’s breathing also seems to slow down when they sleep, as does their heartbeat, although this is understandably more difficult to notice. During brumation—an extended sleep like hibernation—a snake’s heart rate can drop to just 5% of normal. If they were asleep, and you wake them up by handling them, your snake will be quite surprised. This might be a little funny for the owner, but it’s unpleasant for the snake, and they’ll see you as a threat if you do this. Not to mention they’ll be more nervous when it comes to sleep. So, even if you are a budding researcher trying to figure out how much snakes sleep, you shouldn’t disturb them regularly.